NASA’s Voyager mission is headed where no spacecraft has gone before, beyond the space bubble that contains our solar system. NASA’s Voyager mission is headed where no spacecraft has gone before, beyond the space bubble that contains our solar system. EarthSky spoke with Voyager chief scientist Ed Stone. The sun has a wind blowing outward, radially, at a million miles per hour. It creates a giant bubble around the solar system. All the planets are inside the bubble. Voyager I is now 11 billion miles from the sun and is very near the edge of the bubble, which is the edge of interstellar space. Voyager was designed to fly by the four giant outer planets – Jupiter, Saturn, Uranus, and Neptune … And what we discovered was how diverse the bodies are in the solar system. Before Voyager, the only active volcanoes we knew of were here on Earth. After Voyager, we know that there’s a moon of Jupiter which has 10 times more volcanic activity than Earth. Also, before Voyager, we thought that only the Earth had a substantial nitrogen atmosphere. We now know that Titan, a moon of Saturn, has such an atmosphere, although it’s much colder and there’s no oxygen in that atmosphere. I think Voyager will be our first interstellar spacecraft. And the only question is, will we reach interstellar space while we have electrical power, so we can transmit the data home? 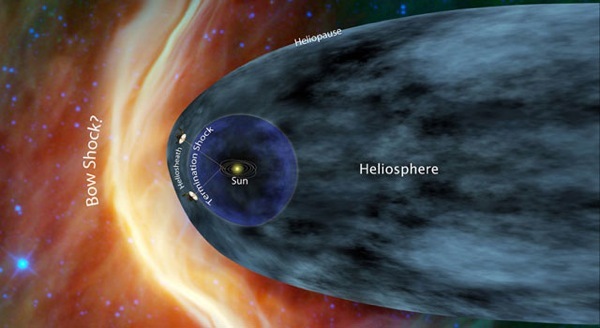 Dr. Stone spoke more about what we know about the heliosphere, the bubble that surrounds our solar system. We now know, for the first time, roughly how large it is. There is a shock which occurs when the supersonic solar wind slows down as it approaches the edge of the bubble. Voyager I crossed that shock six years ago. And Voyager II crossed the shock about three years ago. So we now know that the bubble is on the order of perhaps 12 billion miles in radius in the direction we’re headed. And Voyager I may have on the order of a billion miles or so left to go. It’s now about 11 billion miles from the sun. Perhaps the easiest way to visualize the bubble, Stone said, it is to think of a kitchen sink. If you turn the water on and let it hit the bottom of the sink, with the drain open, you may have noticed that a thick ring forms on the bottom of the sink. Inside the ring, where the water first starts out – it’s very thin and very fast. And that’s where the solar wind is supersonic. But eventually it gets so thin that it has to slow down. And it does that abruptly and forms this thick ring of water, which then turns around and goes down the drain. The same thing happens around our sun. It is the wind from the sun that slows down and eventually has to turn around and go down the tail, behind the heliosphere. And the two Voyagers are now in the thick ring part of our heliosphere, just as in the thick ring in the sink. EarthSky asked Dr. Stone: When the Voyagers pop free of our star’s space bubble, what do you think they’ll find? We know roughly what’s out there, because we have astronomy data. But it really tells us what’s out there much farther away. What we will find out is what’s right around our bubble. We do know that it’s likely to be a cloud of material, which is ejected by the explosions of several supernovae, 5 to 10 million years ago. And they shed most of their mass. We are now enveloped in one of the clouds that came from that series of explosions 5 to 10 million years ago.